MPs' vote on R3 - where does the SNP stand? The SNP MPs made headlines on Wednesday 13th June when they walked out of Parliament during Prime Minister's Questions in support of their leader, Ian Blackford MP, who had been ordered out by the Speaker in a Brexit row. The Scottish MPs are known for sticking together but will they do the same when the MPs get to vote on the National Policy Statement, which is a step towards a third runway? Heathrow has been lobbying the SNP for years and made headlines in Scotland in 2016 when it paid for the SNP Conference. This was not a traditional sponsorship deal but what was described in the Sunday Herald as "a bespoke commercial arrangement" with the SNP. Typically for Heathrow, it refused to say how much it had ploughed into the event - and the SNP wouldn't say either. It was clear that Heathrow was looking for a deal. June 2018 - Neil Keveren and his Uncle Ray start the long drive to Aberdeen. In April 2017, Harmondsworth resident Neil Keveren walked from his home to Edinburgh to meet SNP politicians and talk to people along the route. This June (Friday 8th and Saturday 9th) he went back to Scotland. 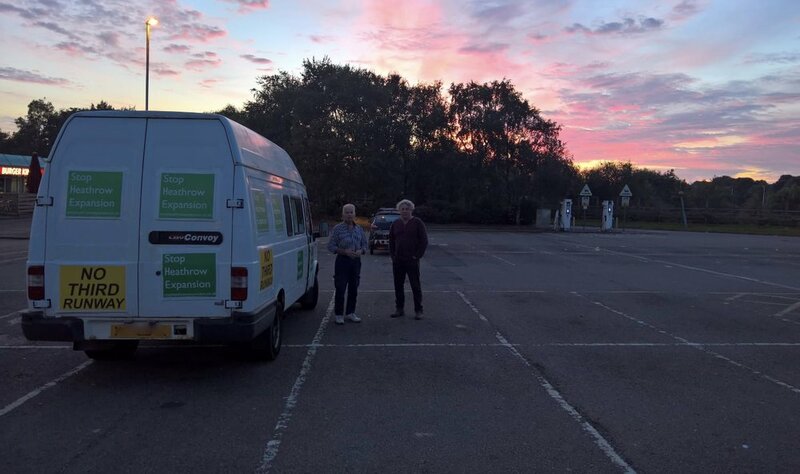 Neil would be driving the van this time, to leaflet outside the SNP Conference in Aberdeen while anti-runway campaigners who were conference ticket holders met SNP politicians and members inside. The purpose of using the van, rather than letting the train take the strain, was to carry a variety of props. One of those was a large papier mache aircraft that Neil often straps to his back at events. Another prop was a large canvas mural, which had been used in Harmondsworth village to show the position of the proposed new boundary fence that would split the village. Neil had intended to add a painted slogan to the mural but his presence generated so much interest from delegates that Neil decided to focus on talking to those attending the conference: it was enlightening. Airport boundary mural, campaign signs and Uncle Ray with his "No Heathrow Clearances" protest. Neil was pleasantly surprised by the strength of support he received from delegates who crossed the road to speak to him. It's quite possible that, with one or two exceptions, only supporters would have taken the trouble to speak to Neil yet the story was the same inside the venue. SNP members were against expansion at Heathrow and were concerned about their party not representing their views. Apparently Heathrow had held events to persuade the SNP to support the third runway but attendance was by invitation only and excluded the rank and file of the party. If the SNP MPs vote on a third runway as a block, which is pretty certain, and vote to support the NPS, which is possible given the intense lobbying, the party would have destroyed any credibility as a party interested in environmental issues. The SNP MPs would also have sided with a government that it accused only last week of "a power grab". Most surprisingly, it will have given the government approval to spend billions in the South East at the expense of Scotland and the North, for little more than some feeble "promises" on jobs and connectivity. There are no guarantees to support the claims of benefits. When the SNP thinks of independence it would have to consider the complication of needing passengers and goods to enter the country via Heathrow. The airport would continue to dominate, despite previous attempts to increase competition by compelling BAA, which used to run a group of airports including Heathrow, to sell off some airports. Heathrow would have gone from the only UK airport with two runways to the only UK airport with three runways. Foreign-owned Heathrow Airport Limited would be back calling the shots thanks to British MPs. The Evening Standard reports that the SNP might shake up the Tories in the coming weeks. Update: We understand that the vote to approve the Aviation National Policy Statement will be held in the evening of Monday 25th June. Prior to the vote there will be a debate from approximately 3pm.